Press statements following Russian-Chinese talks. 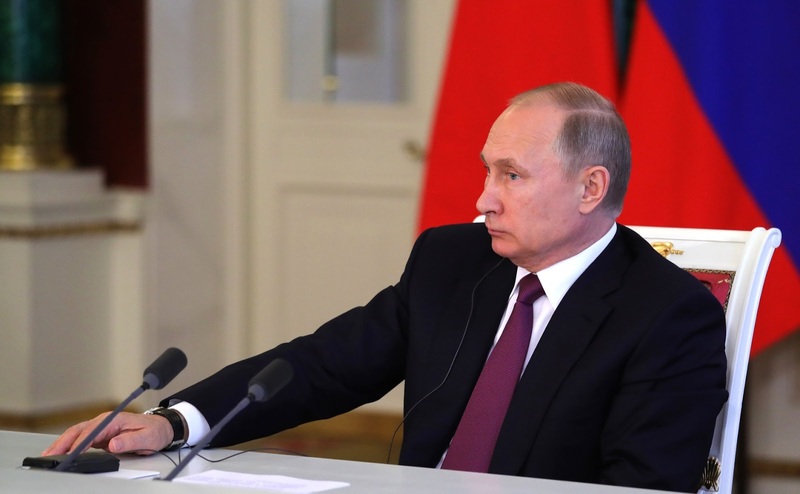 Putin.BLOG China Foreign Policy Press statements following Russian-Chinese talks. 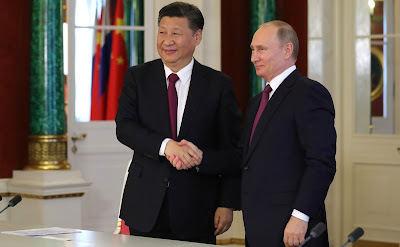 Vladimir Putin and President of the People's Republic of China Xi Jinping made statements for the press following Russian-Chinese talks. 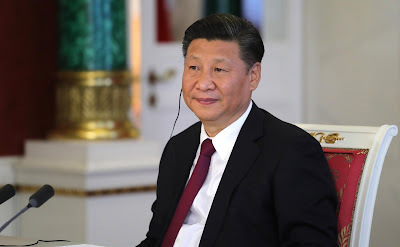 The official visit to Russia by President of the People’s Republic of China Xi Jinping is certainly the central event of this year in relations between our states. Yesterday Mr. Xi Jinping and I had an informal meeting and candidly exchanged views on the most important issues of bilateral cooperation. Today we held intensive talks that included members of the Government and the chief executives of major companies. We arrived at the common opinion that the Russian-Chinese strategic partnership has acquired impressive dynamics in almost all areas. I would like to emphasize that much of the credit for this goes to Mr. Xi Jinping. He was awarded the Order of St Andrew the Apostle in recognition of his personal contribution to the consolidation of friendship between the peoples of Russia and China. As you have seen, I was pleased to present this highest state award of the Russian Federation to our friend in the Kremlin today. During our conversations, we reviewed an entire range of issues regarding Russian-Chinese relations and reached important agreements on the further promotion of bilateral ties in many diverse areas. We conducted an in-depth discussion of economic cooperation, pointing out, in particular, that trade continued to grow this year as it did last year. In 2016 trade increased by 4 percent to $66 billion, while in the four months of this year it went up by a substantial 37 percent or $24.5 billion. Our priority area of cooperation is energy. Russia is a leading oil supplier to China. In 2016, Russia exported 27.3 million tones under inter-governmental agreements alone. Total exports, including commercial contracts, amount to 52.5 million tones. Construction of the Power of Siberia gas pipeline continues on schedule. Let me remind you that this pipeline will transport 38 billion cubic meters of gas over 30 years. 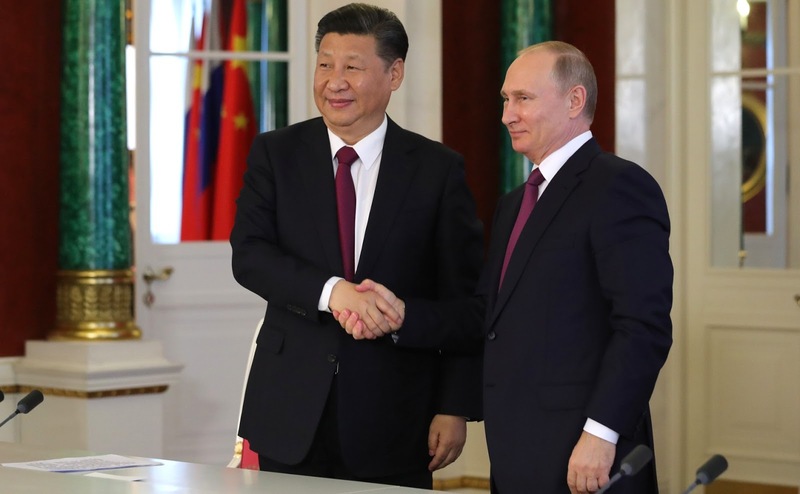 As you saw, top executives of Gazprom and China National Petroleum Corporation have just signed a supplementary agreement on the first natural gas supplies in December 2019. The parameters of the western route have yet to be agreed on. Construction of the Yamal LNG production facility is in the final stages. A significant interest of 29.9 percent in this project belongs to our Chinese partners. As of today, the plant is 90 percent complete and is scheduled for launch at the end of this year. Let me note the successful construction of the first unit of the Tianwan Nuclear Power Plant. Next year, two more units will become operational. We have agreed to continue close cooperation in the nuclear power industry. Today we particularly focused on high-tech industries – primarily, joint space exploration. We are working on the next space program for 2018–2022. Successful joint projects in aviation include the design of a new long-haul aircraft and a civilian heavy helicopter. As concerns transportation, we are developing a high-speed railway project between Moscow and Kazan and discussing the localization of rolling stock manufacturing in Russia. Another transport project is the construction of the Western Europe – Western China motorway. The Russian section is scheduled for completion in 2019. We see big potential in the join use of the Northern Sea Route and the Trans-Siberian and Baikal-Amur railways. This is largely in tune with our Chinese partners' initiatives discussed during the recent The Belt and Road international forum in China. The initiative of the Chinese leader deserves the closest attention and will be supported by Russia in every possible way. I am confident that these large-scale projects will result in intensive trade, modern production and jobs and the rapid development of Russian and Chinese regions. We have set ourselves the task of more actively developing the credit and financial sphere and cooperation in this field. Last year, by the way, cumulative direct capital investment from China increased 12 percent to $2.3 billion. We backed the agreement between the Russian Direct Investment Fund and the China Development Bank to create a joint investment fund with 65 billion yuan. We agreed to continue consultations on the wider use of our national currencies in mutual transactions and in investment. I am sure that this will promote the opening in China of the first foreign office of the Central Bank of the Russian Federation. We see significant opportunities in agricultural cooperation. Last year, the volume of Russian agricultural exports grew 17 percent to $1.6 billion. In addition, a decision has been adopted to increase Russian wheat imports. A document on access to other crops for the Chinese market is currently being finalized. We also discussed the issue of lifting restrictions on the import of Russian meat and poultry products by China. We held an in-depth exchange of opinions on joining the activity of the Eurasian Economic Union with the Chinese initiative of the Silk Road Economic Belt. This is a highly promising direction, putting collective effort in line with our idea to form a broad Eurasian partnership. Vladimir Putin and Xi Jinping make press statements following the talks. Other important issues were also addressed during the talks, particularly humanitarian contacts. We discussed further plans in detail during the meeting Mr. Xi Jinping and I had with representatives of the two countries' general public, business and media communities. We noted the successful implementation of the new ambitious project of exchange years of the Russian and Chinese media. The regular [China-Russia] Media Forum is timed to coincide with Mr. Xi Jinping's visit. The main result of this forum was an agreement on launching Katyusha, our third cultural and educational television channel in China. An agreement on film production was prepared for signing. There is also some good experience in animation production. We intend to further reinforce our scientific and education ties. As of today, some 25,000 Chinese nationals are studying in Russia, and 17,000 Russian students are studying in China. By 2020, education exchanges are expected to reach 100,000 people. Starting as early as September, the first joint Russian-Chinese University in Shenzhen, established with assistance from Moscow State University and the Beijing Institute of Technology, will begin accepting its first students. In the long term, the university will take up to 5,000 students. We also noted a positive dynamic in the tourism industry. Chinese citizens are Russia's biggest group of incoming tourists. In 2016, the number increased to 30 percent, or 1.28 million people. China has become the second most popular destination for Russian tourists, which also indicated considerable growth at 30 percent. Of course, particular attention was paid to international political issues during the talks. Russia and China actively interact on the international arena. We have agreed with Mr. Xi Jinping to boost cooperation in various multilateral formats, in particular, at the UN, the SCO and the G20, which was reflected in our joint statement. In two days, together with Chinese President Xi Jinping, we will take part in the G20 summit in Hamburg. By tradition we will hold a meeting of BRICS leaders there as well. As you know, this year China holds the presidency in this association and will host the official summit in Xiamen in September. Our common foreign policy priorities include a comprehensive resolution of the Korean Peninsula issue with a view to ensuring peace and stability in Northeast Asia. We have agreed to actively promote our common initiative based on Russia’s stage-by-stage plan for a Korean settlement and China’s initiatives for a parallel freeze of nuclear missile activities in the PDRK and the large-scale military exercises by the United States and the Republic of Korea. We exchanged views on the Syrian crisis and other outstanding issues. We discussed the prospects for implementing the agreements on Iran’s nuclear program. To sum up, Russia and China really have very close or identical opinions on all major international issues. We intend to continue developing our foreign policy coordination. In general, today’s talks will further develop the genuinely friendly relations between Russia and China. I would like to thank our Chinese friends for an open and useful dialogue, once again. I would also like to convey my gratitude to our friend, President Xi Jinping. President of China Xi Jinping. Mr. President Putin, Russian colleagues, representatives of the media, good afternoon. I am very happy to meet you with my good friend President Putin. This is my sixth visit to Russia after assuming office as China’s President in March 2013. We have just held our third meeting this year with President Putin, exchanged views on bilateral relations, and a number of major international and regional issues and reached extensive agreements. 0 Comment to "Press statements following Russian-Chinese talks."